Increasing attention is focusing on chromosomal and genome structure in cancer research due to the fact that genomic instability plays a principal role in cancer initiation, progression and response to chemotherapeutic agents. The integrity of the genome (including structural, behavioral and functional aspects) of normal and cancer cells can be monitored with direct visualization by using a variety of cutting edge molecular cytogenetic technologies that are now available in the field of cancer research. Examples are presented in this review by grouping these methodologies into four categories visualizing different yet closely related major levels of genome structures. An integrated discussion is also presented on several ongoing projects involving the illustration of mitotic and meiotic chromatin loops; the identification of defective mitotic figures (DMF), a new type of chromosomal aberration capable of monitoring condensation defects in cancer; the establishment of a method that uses Non-Clonal Chromosomal Aberrations (NCCAs) as an index to monitor genomic instability; and the characterization of apoptosis related chromosomal fragmentations caused by drug treatments. Cytogenetic visualization technologies have traditionally played an important role in cancer research. Both the chromosomal number changes or aneuploidy, and the telomeric deficient mediated chromosomal breakage-fusion-bridge cycle has long been linked to the cancer phenotype and chromosomal instability by T. Boveri and B. McClintock. Many chromosomal aberrations, particularly translocations or inversions are closely associated with a specific morphological or phenotypic subtype of leukemia, lymphoma or sarcoma . As a result, chromosomal analysis of patient samples has become an essential component of cancer research. The identification of a chromosome translocation involving a reciprocal rearrangement of chromosomes 8 and 21 in patients with a form of acute myelogenous leukemia (AML), and the identification of a translocation involving chromosomes 9 and 22 in patients with chronic myeloid leukemia (CML), has initiated more than 100 translocation breakpoints cloned with the genes on both partner chromosomes identified. In the past three decades, over 30,000 cancer cases have been analyzed by chromosomal karyotyping employing one basic visualization method using normal chromosomes as a standard, to search for the correlation between a specific karyotype and a specific type of cancer, which revealed more than 600 acquired, recurrent, balanced chromosome rearrangements . Among these analyses, a great deal of attention has been focused on clonal chromosomal changes in the identification of both primary and secondary abnormalities. These clonal abnormalities, particularly if complex, are significant to neoplasia. As a result, these chromosomal visualization methods have served as an important tool for both cancer research and diagnosis. In recent years, extensive research has been performed with molecular probes targeting specific regions of the genome for detecting gene deletions and amplifications. With the development of live images as well as the maturation of FISH related technologies, more direct visualization approaches are available to cancer biology [3–6]. In this mini-review, we will introduce some of the current visualization methodologies utilized in this field including a discussion on several recent developments initiated by our laboratory, specifically using DNA-protein co-detection to define the chromatin loop domain, using Defective Mitotic Figures to study the condensation process, and using Non-Clonal Chromosome Aberrations (NCCA) to monitor the genomic instability in cancer. With the completion of the sequencing phase of both human and mouse genome projects, one of the next priorities is the systematic study of genomic structure relative to function as well as abnormalities associated with the cancer phenotype based on recent emerging genomic information. A powerful application of newly available technology is the use of microarrays to correlate specific genes or pathways to types or stages of cancer , particularly when used in conjunction with the tissue micro-dissection method. The challenge for this approach is the complexity of the karyotypic changes that occur and the karyotypic heterogeneity that is associated with cancer cell lines and tumor samples. It is therefore necessary to carefully karyotype the cell lines/tissues being studied before microarray analysis is performed. CGH technology has been effective in establishing possible karyotype patterns by pinpointing the gains or loses within specific chromosomal regions . Since CGH data focuses on clonal karyotype changes it could miss non-clonal changes that occur at an early stage of cancer development (this is further discussed in the following section). Similarly, the heterogeneity of tumor samples makes the interpretation of data difficult with significant exceptions occurring when various samples of the same tumors are analyzed. Gene knock out technology has produced a large collection of mouse models that can be used to study genomic aberrations that occur during cancer development. Particularly with the recent development of RNA interference technology , the correlation between different pathways defined by key genes and the genomic structure/function can be analyzed in great detail. The technical challenge for studies dealing with genome structure and function that use this approach is to develop a system that can monitor the genome structure and changes caused by these targeted genes. It would be ideal to directly visualize the changes occurring before and after dysfunction of genes that are expected to be involved in the maintenance of the integrity of the genome. Such a direct visualization system will fill the gaps between molecular biology and cytology, between studies using in vitro and in vivo assays, and could be used for comparative analysis between normal and cancer conditions. One re-emerging concept in cancer research is that epigenetic events also play an important role in the evolution of cancer . Cancer often displays aberrant methylation of promoter regions, which is linked to the loss of gene function. Such heritable DNA changes are not mediated by altered nucleotide sequences and might involve the formation of transcriptionally repressive chromatin. Visualization methods are urgently needed to study cancer related epigenetic phenomena. A new trend in cancer research is focusing on how genetic instability causes cancer . Since the majority of cancers reflect genomic instability at the chromosomal level, the concept of aneuploidy and segmental aneuploidy (unbalanced structural rearrangements) in tumors are receiving increased attention, and accordingly, there has been a reappraisal of genetic abnormalities at the chromosomal level. The establishment of a visualization system capable of quantitatively monitoring genomic instability at the chromosomal level (chromosome instability or CIN) is a key challenge. This is especially crucial at the early stages of cancer development when there are no clonal chromosomal aberrations detectable. Another important consideration for this system is the capability of monitoring an entire genomic structure of an individual cell and the capability to monitor a mixture of isolated cells in a heterogeneous population. This type of system would be capable of addressing the heterogeneity of genomic changes in cancer. Most of the visualization technologies discussed here are fluorescence based, even though various labeling and detection mechanisms are involved for each of them including antibody detection, DNA-DNA/DNA-RNA in situ hybridization, photobleaching and differential labeling (e.g. replication pulse-labeling). The significance of the availability of these methodologies is to apply them to a variety of experimental settings that address all aspects of the genomic structure/function and abnormalities. For presentation purposes, the various types of visualization technologies are grouped into four categories, with representative examples of each major level of the genome structure. To monitor the specific protein-protein or protein-DNA/RNA interactions, different approaches were developed using direct and indirect visualization. An important technology is the monitoring of the DNA-protein and protein-protein interactions in living cells. Using GFP fusion proteins and FLIP (fluorescence loss in photobleaching) or FRAP (florescence recovery after photobleaching), as well as FRET (fluorescence resonance energy transfer) and FCS (fluorescence correlation spectroscopy), the dynamic interactions between proteins and genomic structure and dynamic mRNA movement in the nuclei have been demonstrated by monitoring the patterns of fluorescent bleaching and recovery [5, 6]. For example, FRET analysis has demonstrated that the proteins of WRN and RAD52 form a complex in vivo that co-localizes in foci associated with arrested replication forks . FRET has also been used to study the interaction of p53 with nuclear matrix showing that the interaction of p53 with the nuclear matrix is mediated by F-actin and modulated by DNA damage . One area of increasing interest is the study of the mechanism of chromatin re-modeling and its relationship with improper gene expression and cancer . The above-mentioned methods will play an effective role characterizing elements of the remodeling complex and its interactions under normal and pathological conditions. Protein-DNA interaction can also be visualized using released chromatin fibers [15, 16]. More advanced than commonly used co-localization that uses interphase nuclei, the released DNA or chromatin fibers offer a higher resolution with significantly improved accuracy. As demonstrated by Raderschall et al the recombination proteins including Rad51 and RPA can be visualized as associated with long stretches of ssDNA that appear after treatment of cells with DNA-damaging agents . The methods are under development in our laboratory to study the chromosome condensation process by cross linking the protein complex prior to the release of chromatin fibers. We anticipate that this methodology will be particularly useful to compare specific DNA-protein interactions in normal and cancer cells to study the pathway of tumorigensis. The chromatin loop domain is an important concept for understanding the structure and function of the chromosome. The loop domain has been suggested as the basic unit of chromatin structure. To define the loop domain, direct visualization is the key. By releasing proteins, the nuclear halo structure allows us to measure the loop size, study the distribution of both genes and regulatory sequences on loop domains, correlate gene expression with patterns of loops and to compare specific regions of the chromosome [4, 18–22]. Using transgenic and cell transfection approaches, we recently demonstrated that when multiple-copy nuclear matrix associated regions (MARs) were introduced into the genome, these MARs were selected and used as nuclear matrix anchors in a discriminatory manner, which fits well with the gene expression profile of these transfected lines, despite the fact that each contained identical primary sequences. Combined with data on the dynamic feature of the chromatin loop domain, our experiment suggested that MAR anchors are necessary but not sufficient to cause loops to form that are correlated with gene expression profiles . The in situ hybridization and immunolocalization approaches have been used to investigate the nuclear location of specific DNA sequences connected to the chromatin insulator. It has been shown that a DNA sequence that is normally located inside the nucleus moved to the periphery when a gypsy insulator was placed within the sequence. In addition, it has been shown that the presence of a gypsy insulator can bring two sequences from different regions of the genome together. Interestingly, these physical changes that were caused by the insulator correlated to the gene expression profile . The topology of the Major Histocompatibility Complex (MHC) and its surrounding genomic regions were investigated using direct visualization. In contrast to the gene poor regions, the gene rich MHC region displayed dynamic changes that corresponded to the gene expression status. Specifically, when MHC class II genes are expressed, the MHC genomic region was located on a large chromatin loop extending from the periphery of the human chromosome 6 domain more often than when these genes were silent . Focusing on loop structure formation and behavior, our laboratory has been investigating the meiotic chromatin loop structure and the relationship to the synaptonemal complex (SC). Using transgenic and direct visualization approaches, we demonstrated that certain anchor sequences might be required for the formation of normal meiotic loops and the organization of loop structure depends on both DNA sequences and chromosomal position [26, 27]. Recently, the relationship between the length of the SC, the AT/GC content of the genome and the size of chromatin loops has been under investigation to correlate the meiotic chromosome structure with genetic recombination (Heng et al, personal communication). Basic information regarding the loop domain in normal cells can be used comparatively to visualize the pattern changes of loop domains in cancer. It has been shown with the use of special AT-rich sequence-binding protein 1 (SATB1) that the anchoring site to the nuclear matrix is cell type dependent, and the overall loop organization is different for breast cancer SK-BR-3 cells . Another cancer related issue is the virus integration patterns within the human genome. At the chromosomal level, the integration patterns of a few types of virus have been investigated using FISH detection . It has been shown that for the adeno-associated virus (AAV), the integration site is chromosomal region specific. Interestingly, as demonstrated by FISH methods, such specificity as observed in the wild type AAV are lost in recombinant AAV . Currently we are investigating the pattern of viral integration using loop domain assays to illustrate the basic mechanism for viral integration. We have noticed that various types of virus have different patterns of integration relative to chromatin loop regions or loop anchor regions as defined by the nuclear matrix. Further research is underway to test whether such a pattern of integration is related to the stability of the integration. In addition to monitoring loop domains, interphase FISH has been used to monitor the abnormality of DNA replication focusing on specific replication domains (Wu et al, personal communication). The asynchronous replication pattern between alleles of imprinted regions has also been visualized by interphase FISH. Different from most loci where the maternal and paternal alleles replicate synchrony, the expressed allele of the imprinted regions replicates earlier than the silenced one . As mentioned in the introduction, chromosome structure studies have traditionally played an important role for cancer research. In recent years, additional details have emerged to link specific chromosomal structural and behavior changes to the cancer phenotype. Specific chromosomal regions including the telomere and centromere as well as regions hosting key cancer related genes are under extensive study. A few visualization technologies are worth mentioning: 1) Quantitative fluorescence in situ hybridization (Q-FISH) can be used to monitor the telomeric DNA length changes during aging and cancer development ; 2) High-resolution fiber FISH can be used to estimate the size of a gene amplification and to define the translocation regions [15, 16, 32]; 3) DNA-protein in situ co-detection on mitotic/meiotic chromosomes as well as released chromatin fibers [3, 26, 33, 34]; 4) Rolling circle amplification in situ can be used to detect gene copy number and single base mutation in fixed cells with high efficiency (up to 90%). It can also detect and quantify transcribed RNA in individual cells making it a versatile tool for cancer research ; and 5) The recently developed experimental system of using GFP and Lac repressors can be used to monitor chromosomal loci in live cells . Chromosomal structure or aberrations capable of monitoring the condensation defect is an area of research that has not received much attention. The four stages of the chromosomal cycle including replication, condensation, segregation and de-condensation are each essential steps that are equally important to maintaining genomic instability. Yet, traditionally, there have been extensive studies focusing only on the replication process and the segregation process as well as their regulation [37, 38]. Despite the recent dramatic developments in identifying genes that are responsible for chromosome condensation , there is still a shortage of biomarkers and experimental systems that can monitor condensation defects in cancer. Original work on the abnormal features of mitotic figures was initially named as incompletely-packaged chromosomes, that are a result of abnormally condensed chromosomes (Fig 1) . As demonstrated by Fig 1, the key feature of this structure is the differential degree of condensation among chromosomes within the same mitotic figure. Since the original description a great deal of work has linked these structures to known chromosomal aberrations such as chromosomal breakages and translocations . However, due to an unproven common opinion that these structures represent artifacts, this work has been overlooked, even though the concept of using experimental manipulation to generate decondensed chromatin fiber has lead to the successful development of the high resolution fiber FISH [15, 42]. The continuation of this project has established a correlation between the rate of these structures and the cancer phenotype (Heng et al., unpublished data). A similar observation recently reported involving delayed replication was investigated using human and mouse hybrid cells and primary tumor samples . Chromosome condensation is an important step affecting genome integrity and instability; therefore the characterization of defective condensation is of importance. In the past few years, our Laboratory has systematically studied these structures renamed defective mitotic figures or DMFs. Extensive research has illustrated the cause and biological consequences of DMFs, as well as the connection to chromosomal instability. Examples of DMFs. Panels A-C are Giemsa stained images of the Defective Mitotic Figures (DMFs) detected from human lymphocyte cultures following brief treatment with inhibitors of Topo II. As illustrated by these images, the key feature of DMFs is the differential condensation status among various chromosomes, resulting in the coexistence of condensed metaphase chromosomes and the uncondensed chromatin fibers within one mitotic figure. In normal mitotic figures all chromosomes condense at the same rate with no evidence of uncondensed chromatin appearing with condensed chromosomes. It should be noted that there are two types of DMFs classified as polarized and non-polarized. Fig 1A,1B shows condensed chromosomes and uncondensed chromatin or less condensed chromosomes in a polarized pattern. Fig 1C shows a non-polarized DMF. One biological application that can be derived from the morphology of DMFs is that in the abnormally condensed regions, chromatin fibers tangle with each other, which generates chromosomal breaks in later stages of the cell cycle when condensed chromosomes begin to segregate as observed in many cancer cells. Another example of chromosomal structural/behavior errors causing karyotypical herterogenity comes from the analysis of chromosomal breakage-fusion-bridge (BFB) events in solid tumors. Various types of nonspecific chromosome aberrations were detected in malignancies with frequent BFB events, as well as intra-tumor heterogeneity , suggesting that the BFB events are responsible for the karyotypical heterogenity. One of the hallmarks of tumor cells is their highly rearranged karyotypes. Karyotype analysis has been extensively used to study clonal chromosomal aberrations in cancer. It has been a great challenge to analyze solid tumors due to the difficulties involving chromosome preparation and karyotype heterogeneity. In the last decade, impressive progress has been made to introduce new powerful methods. Two of the most significant developments are the establishment of CGH and SKY or M-FISH technologies [8, 45, 46]. By avoiding preparation of cell cultures and metaphase chromosomes derived from tumor samples, CGH has been used for karyotype analysis of primary tumors and even archived pathological samples. The limitation of CGH includes the inability to detect translocations and detection is limited to large, clonal, late-stage karyotype changes in cancer development. These limitations can be overcome by using single cell CGH combined with SKY. Single cell CGH has been successfully used to study the heterogeneity of the genome and its karyotype evolution among cancer cells. By analyzing both primary tumors and later arising metastases, Schmidt-Kittler et al analyzed the karyotypic link between these two events. Surprisely, there is an increased heterogeneity when these two events occur. Disseminated cells from patients after curative resection of the primary tumor displayed significantly fewer chromosomal aberrations than primary tumors or cells from patients with manifest metastasis, which challenges the current view that the precursors of metastasis are derived from the most advanced clone within the primary tumor . The advantages of SKY or M-FISH are the efficient identification of the origin of complex marker chromosomes and the ability to simultaneously screen the entire genome for chromosomal aberrations. This new approach serves as an effective screening tool to identify structural abnormalities such as translocations and marker chromosomes. One recent development is the combinational use of the SKY method with other visualization methods. Following the DNA-protein co-detection method initially used by our laboratory and others to study the chromosome and chromatin structure , SKY combined with FISH, protein detection and G-banding has been established and tested in the clinical setting [48–50]. These combined approaches allow us to monitor the entire genome, as well as to focus on specific regions or biological process (Fig 2). Further, the introduced protocols for sequential multicolor FISH/SKY and reuse of FISHed slides should be valuable for cytogenetic analysis with tumor samples especially when the samples are limited. An example of this was the use of SKY and protein co-detection demonstrating that the SC length and the size of mouse mitotic chromosomes were not correlated , which served as a method to study the inconsistency between meiotic and mitotic structure (Heng et al, personal communication). The same method combined with DNA-protein co-detection has been successfully used to monitor meiotic chromatin pairing behavior in ATM -/- mouse. Even though the SC structures are clearly abnormal for the ATM KO mouse, the chromatin alignment seems normal shown by chromosome painting. Our data further demonstrated that the precise paring was jeopardized, suggesting the function of SC is not for the chromatin alignment but the specific paring (Heng et al, 18th International Congress of Genetics, Beijing, 1998). We anticipate that the SKY-FISH and protein co-detection methods will increasingly be used to monitor chromosomal aberrations, particularly when both overall genome changes and specific gene deletions or amplifications need to be simultaneously visualized when performing a genomic screening. Examples of SKY-FISH co-detection. 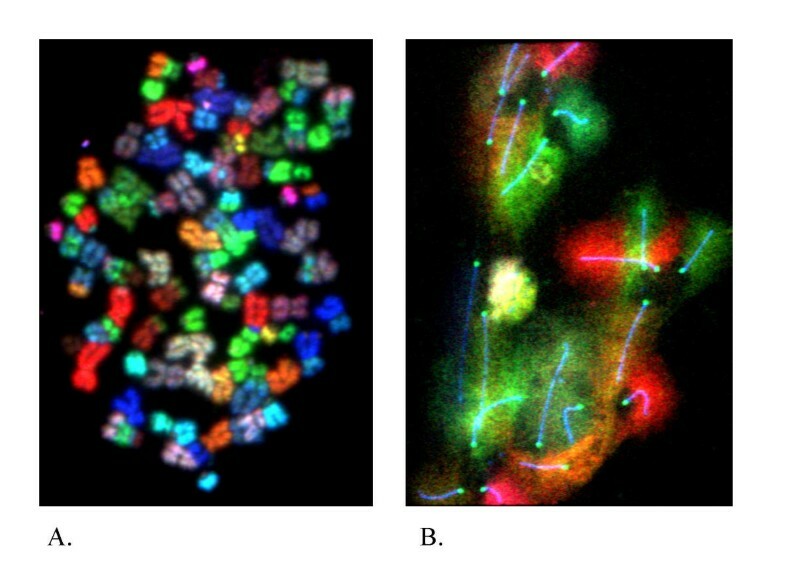 A. SKY detection on human mitotic chromosomes prepared from a primary tumor showing the high rate of translocations indicated by the mixed color on the same chromosomes. Over 30 translocation events can be detected. Particular attention should be paid to the high rate of Non-Clonal Chromosomal Aberrations (NCCAs) as well as the clonal translocations. In this case, the majority of the translocations were NCCAs. B. SKY-protein co-detection on meiotic mouse chromosomes. Both the synaptonemal complex (SC) and the centromere were highlighted by the antibody for SC specific proteins and centromeric protein prior to SKY detection (blue and green color respectively). The various colors can be used for chromosomal identification since each chromosome has been assigned a specific color. It should be noted that the subtle color differences can be recognized by the computer program, which is much more sensitive than human eyes. Pertaining to the analysis of disrupted SCs from various defective mice, the SKY identification of individual meiotic chromosomes will permit the quantification of mis-pairing at meiotic prophase. One important application for SKY is the systematic analysis of the correlation between the functional status of "caretaker" genes (DNA repair, carcinogen detoxification and antioxidant genes) and specific karyotype changes. With this approach, a number of knock out mouse cell lines and various cancer cell lines that are genomically unstable have been analyzed with SKY (including ATM, p53, BRCA1 cell lines). The unsuccessful identification of specific clonal karyotype changes, thought to be shared by the same types of tumors, coupled with a lack of any clonal changes at early stages of the cancer development, has highlighted the importance of non-clonal chromosomal aberrations (NCCAs). NCCAs have been traditionally thought to be not as important as clonal chromosomal changes, since clonal changes, when complex, are the signature of cancer . NCCAs, on the other hand, have not been used as an index to monitor tumor progression particularly when the rate was low. According to our recent data and the publications of others, the key feature of an unstable genome is increasing rates of NCCAs, as measured by random translocations, deletions and aneuploidy. The increased rates of total chromosomal aberrations including NCCAs have been considered in the field of mutation research; however, NCCAs have received less attention in the clinical cancer field. Currently, our laboratory is focusing on the establishment of a new index to monitor genomic instability based on the rates of NCCAs, particularly at the early stages of cancer development. Our preliminary results demonstrated that for ATM, BRCA1, p53 deficient cells, that NCCAs signify the initial detectable changes that occur in abundance well before the appearance of any clonal aberrations. Our experiments have also shown in selected test conditions that NCCAs are the key elements initiating the formation of clonal chromosomal changes and that NCCAs provide the basis for various populations of clonal changes that caused the formation of karyotypical heterogeneity in cancer. Thus, the concept of NCCAs reconciles the many seemingly contradictory phenomena regarding the correlation between specific karyotypes and types of cancer. Technologies have been developed to monitor chromosomal behavior changes and their consequences in disease conditions. A classic example was the tracing of the order of chromosomal segregation using centromere separation patterns. It has been shown that human centromeres of various chromosomes separated in a nonrandom apparently genetically controlled sequence. This order does not correlate with the length of chromosomes and the position of the centromere within the chromosomes. In humans, chromosomes 18, 17 and 2 separate very early while chromosomes 1, 16, Y and some chromosomes from the D and G groups separate last. Accumulating evidence has further demonstrated that for a given genome, there is a nonrandom, species-specific sequence of segregation for the chromosomes. Based on a series of studies, it has been proposed that aneuploidy may be the result of out-of-phase separation of a given chromosome. The order of separation has also been investigated using mouse-human hybrid cell lines. The data clearly demonstrated that human chromosomes separate early and mouse chromosomes separate late. Interestingly, the human genome also completed its DNA replication before the mouse genome did . Since the segregation defect has proven to be crucial for genomic instability, it is worth reinvestigating this issue using newly available concepts and molecular tools [53, 54]. The order of chromosomal replication among all human chromosomes has been extensively investigated using BrdU pulse labeling and detection . It is known that the R-bands replicate early while the G-bands replicate late. Interestingly, the input patterns of chromosomal mutations are highly organized relative to the band patterns along human chromosomes . This strongly suggests that cancer related chromosome aberrations are closely related to the chromosomal structure and banding patterns. Thus, It is essential to correlate the patterns with abnormal DNA replication, chromosomal condensation and segregation relevant to the temporal order. Increasing research has focused on the studies of histone modification including methylation, acetylation and phosphorolation. The overall patterns of these modifications can be clearly visualized by applying specific antibodies on normal and abnormal chromosomes. The staining patterns of these antibodies on chromosomes have been used to study the following: X chromosome inactivation [57, 58], the demethylation patterns of the paternal and maternal genome , the chromosome condensation status , as well as the complex relationship between DNA methylation and chromatin/chromosome compaction . We anticipate that this type of approach will have considerable applications to cancer research. For example, the less-well spread mitotic figures prepared from some tumors have been observed with changed methylation patterns. Using H3-phosphoralation as a marker, Smith et al also demonstrated that delayed replication could cause delayed condensation . Using H3-phosphoralation and SMC2 antibodies, our work on the characterization of DMFs also demonstrated that condensation defects contributed to the generation of DMFs in cancer cells. In addition to monitoring histone modification, other structural proteins or RNA complexes and their modification status have been extensively studied using chromatin/chromosomes as targets. The studies on chromosomal condensin and cohesions are among the best examples [54, 62]. To understand the systematic output of genetic information generated from the genome project, one has to analyze overall genomic structure and function. Since the genome is spatially organized within the nucleus and this organization represents a critical dimension to genome function, the definition of chromosomal territories and linking structural features with gene function is a high priority. It is now accepted that chromosomes form distinct substructures that occupy defined positions within the nucleus . Yet, such arrangements are highly dynamic and the changes in patterns frequently occur dependent on biologically functional requirements. Current approaches to visualizing chromosomal territories include the analysis of the relative positions of chromosomes, the relative positions of genes within chromatin domains and the chromosomal or gene position changes when physiological or expression status changes occur [64, 65]. By analyzing the nuclear organization of every human chromosome, it was shown that the most gene-rich chromosomes are concentrated at the center of the nucleus, whereas the more gene-poor chromosomes are located towards the nuclear periphery regardless of the chromosome size or position within the nucleus . When comparing the relative positions of chromosomes from normal and cancer cells that bear specific translocations, it has been demonstrated that the relative position of chromosomes in a nucleus can be conserved between normal and cancer cells . It would be interesting to investigate whether this conservation is retained when additional chromosomes are involved in translocations and if the spatial relationship changes when some chromosomes are deleted. Recently, by using spatial mapping of gene loci involving a particular chromosomal translocation, Roix et al provided evidence that higher-order spatial genome organization rather than any particular property of individual genes is the key contributing factor in the formation of recurrent translocations . Traditional thinking was that translocations are random events occurring among all chromosomes but that cancer related specific translocations were the result of clonal selection after the translocation formed. Genes are also not randomly distributed on chromosomes. Highly expressed loci such as housekeeping genes form large clusters on several chromosomes separated by domains containing relatively low level expressed genes . In addition, for specific genes, the activities are also associated with the location and behavior of dynamic domain regulation. With an over-whelming accumulation of information developing from this emerging field, evaluation of data and its integration is an important task. Systematic comparisons between normal and cancer cells, using different types of cells, are essential. One priority is to incorporate this new concept with classic cytology and cell biology phenomena, as well as the extensive biochemical and molecular data that is available. One effective way to study genome structure is to monitor the induced abnormalities by changing the specific pathways or physiological environment of the cell. Since the abnormalities might be detected from structural, behavioral and functional aspects, the different systems that we have discussed in this review can be used for this purpose. There are a variety of ways to introduce physiological and environmental challenges. Increasing attention has focused on the biological link between oxidative stress and disease conditions . Generated by normal physiological processes including aerobic metabolism and inflammatory responses, free radicals can target DNA, proteins, RNA and lipids, which can cause cancer . It would be interesting to systematically monitor the impact of oxidative stress on chromosomal instability. Using the Q-FISH method, it has recently been shown that the rate of telomere shortening was increased under 'normal' levels of oxidative stress in Ataxia telangiectasia (ATM) cells. Experimentally induced oxidative stress increased the rate of telomere shortening in ATM cells but not in normal fibroblasts and the telomere shortening rate decreased in both normal and ATM fibroblasts if cultures were supplemented with the anti-oxidant . To introduce a chemical challenge, any reagent that can interfere with any essential cellular processes needed to maintain the normal state can be used, particularly with reference to cancer therapeutic agents. Knock out technology including KO mouse and RNAi that produce a defined challenge specific to different pathways deserves special attention. These challenges, when combined with the visualization of chromosomal and karyotypical responses, particularly with drug treatment to challenge the genome stability, will uncover the mechanism behind genomic instability and establish new biomarkers for cancer diagnosis. Recently, by challenging ATM (+/+), (-/-) and p53 (+/+), (-/-) with various drugs targeting DNA replication and condensation, we have demonstrated that the ATM and p53 deficit lines are extremely unstable on karyotypic level comparing with the wild type lines (Stevens et al, personal communication). The availability of patient materials for cancer predisposition syndromes, including Ataxia Telangiectasia (AT), Nijmegen Breakage Syndrome (NBS), Bloom Syndrome (BS), Werner Syndrome (WS) and Fanconi Anemia (FA), provide yet another important resource to study karyotypic changes particularly when combined with a variety of experimental challenges . Many of these cancer-prone genetic disorders involve proteins associated with homologous recombination , and some of the pathways are well connected with each other, yet the signature chromosomal aberrations are quite different for each disease. In other words, even though the increased chromosome aberrations are common features for these diseases, the dominant types of chromosome aberration as well as the karyotypic response to chemical challenges are quite different. For example, the most obvious karyotypic changes seen in cells from BS patients are a significantly increased frequency of sister-chromatid exchange (SCE) and the presence of symmetrical quadri-radial configurations at metaphase. In cells from WS patients, the greatly increased spontaneous chromosome changes are detected including extensive deletions, reciprocal translocations and inversions. As for cells from FA patients, the karyotypic diagnosis is the chromosomal sensitivity to cross-linking agents like mitomycin C [74, 75]. One example of tracing karyotypic changes responding to experimental challenges is our own research on characterizing chromosomal fragmentations induced by chemotherapeutic agents. By studying the morphological features and how they are generated, we aim to establish metaphase mediated chromosome fragmentation, which could represent another apoptotic pathway (Stevens et al, personal communication)(Fig 3). Another example is the experimental induction of condensation defects. When incorporated into late-replicating DNA, 5-Azacytidine (5-aza-C) and 5-azadeoxycytidine (5-az-dC) can inhibit condensation in mammalian constitutive heterochromatin (human chromosomes 1,9,15,16 and Y) and facultative heterochromatin (inactive X). When applying 5-iododeoxyuridine (IdU) or binding of AT-specific DNA ligands (berenil, DAPI, distamycin A and Hoechest 33258), the condensation of AT-rich constitutive heterochromatin was interfered with. To study the mechanism of experimentally induced condensation defects, it was proposed that both DNA hypomethylation and steric alteration in chromosomal DNA could interfere with the binding of proteins or protein complexes responsible for chromosomal condensation . Interestingly, a similar type of condensation defect can be observed from lymphocyte cultures of patients with ICF syndrome (immunodeficiency, centromeric region instability, facial anomalies). ICF is a unique DNA methylation deficiency disease diagnosed by an extraordinary collection of chromosomal aberrations involving the vicinity of the centromeres of chromosomes 1 and 16 in mitogen-stimulated lymphocytes. These chromosomal aberrations include decondensation of centromere-adjacent (qh) heterochromatin, multi-radial chromosomes, and whole-arm deletions . It is also worth mentioning that 5-azadeoxycytidine is an inhibitor of DNA methyltransferase, and hypermethylation of tumor suppressor genes and hypomethylation of CpG islands in oncogenes is linked to tumor initiation and cancer progression . Examples of Chromosome fragmentation induced by drug treatment. 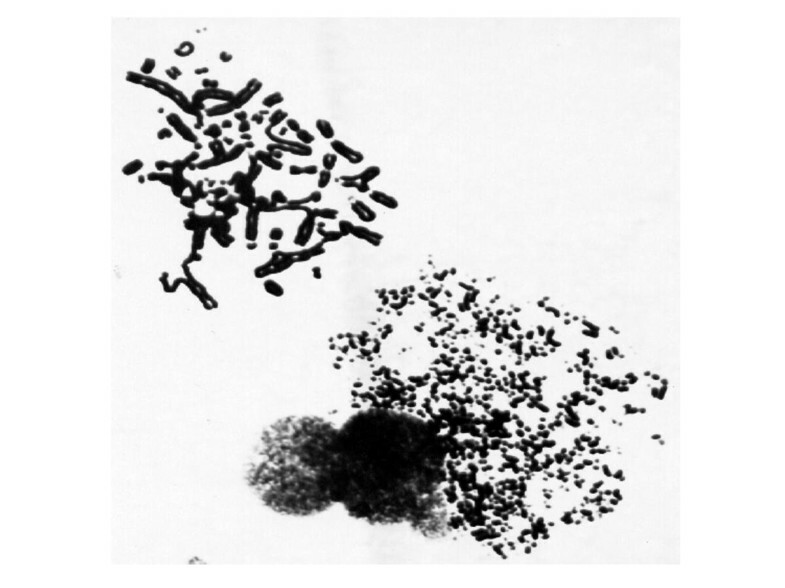 Two images from the same microscopic view represent different types of chromosome fragmentation following drug treatment. The upper image shows a large number of fragments coexisting with abnormal chromosomes. 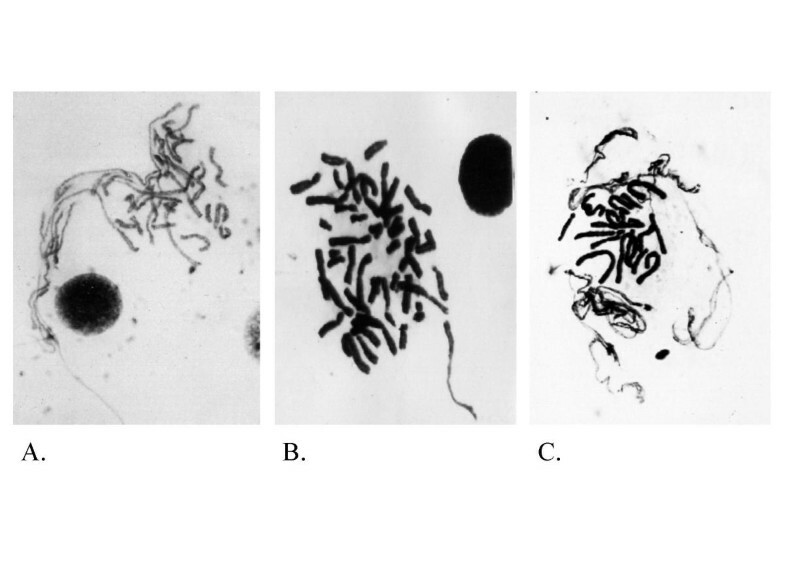 The lower image shows that extensive chromosome fragmentation has occurred with only a few identifiable fragments. These various images may represent different stages of chromosome fragmentation. Due to considerable number of publications on this subject, it would be extremely challenging to produce an all-inclusive summary of all the new developments on direct visualization technologies and their applications to cancer research. This concise review highlights current trends focusing on areas of personal expertise and research interest, plus revisited classical approaches that are presenting new applications for cancer research. It should be emphasized that direct visualization methods as are currently used in cancer research are reaching far beyond genomic structure research. Currently, active research on monitoring non-chromosomal cellular components also plays an important role in the study of genomic organization and integrity . The extensive studies on the centrosome are one such example . In addition, the concept of visualization has been developed beyond the direct use of chromosomes or cells as targets. A new trend in cancer research is the combinational visualization with microarray technology for high-throughput . One example is the development and application of array CGH , which can monitor whole genome detection of chromosomal gains and losses at high resolution. We believe that direct visualization methods will be used to a greater extent in cancer research in the near future and these new methodologies will be used to uncover new details on chromosomal and genome structure that will form the basis for emerging novel concepts. This work was supported by the start-up fund for H.H. from the Center for Molecular Medicine and Genetics, Wayne State University School of Medicine, the fund from Karmanos Cancer Institute, and the R&D fund for C.J.Y. from SeeDNA Biotech Inc., Windosr, Ontario. We apologize to those authors whose work has not been included in this review due to the editorial restrictions. HH drafted the manuscript. JS, GL, SB and CY participated in the data analysis and presentation. All authors read and approved the final manuscript.